You are here: Home / Kitchen / All Lasagna Pans Are Wrong…. Or Is It Just Me? All Lasagna Pans Are Wrong…. Or Is It Just Me? Lasagna pans are either too wide or not quite wide enough. I've been making lasagna more often of late.... My friends and family love my lasagna — and a big pan of lasagna makes it so easy to feed a crowd. When I make lasagna, I generally make two pans; I cook one right away for eating, and I stick the other in the freezer for unexpected company or spontaneous parties. I've never been thrilled, though, with my lasagna pans. I have a metal roaster that I use, and a slightly smaller glass casserole dish. I don't like making acidy, tomato-based dishes in the non-stick metal roaster, and the glass casserole isn't quite deep enough. Well, neither of them is deep enough, but the glass casserole barely allows me to squeeze in 3 layers — I want room for at least 4 layers, preferably 5 or 6 layers. I decided I needed a new lasagna pan — two new lasagna pans, actually — and I'm willing to spend some decent money if I can find the right lasagna pan. I've been scouring the internet for the perfect lasagna pan. I'd buy two, if I could just find the right pan. I haven't found it yet. The big problem is the dimensions of the pans. 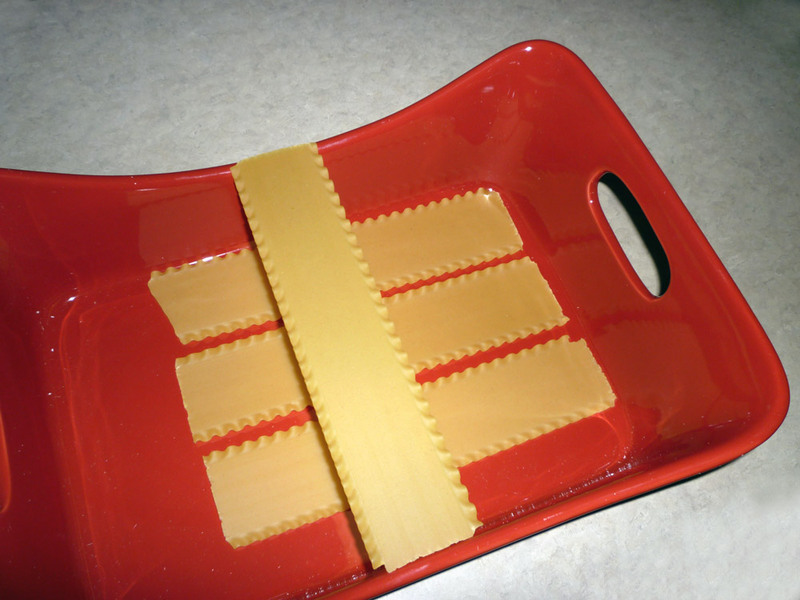 The perfect lasagna pan would perfectly accommodate 3 noodles side by side, or 4 plus an additional noodle at right angles, or 4 plus 2 additional noodles at right angles. Smallest pan: About 10 inches long (just long enough to hold the full length of the lasagna noodle), and about 7 inches wide, just wide enough to hold 3 noodles side by side. Medium pan: A little over 12 inches long — to accommodate the length of a lasagna noodle plus the width of an additional lasagna noodle — and about 10 inches wide, to hold 4 noodles side by side. Largest pan: About 14 1/2 inches long — to accommodate the length of a lasagna noodle plus the width of two additional lasagna noodles — and about 10 inches wide, to hold 4 noodles side by side. Remember, those are the interior measurements we want. The exterior measurements depend on the thickness of the side walls and the size of the handles. 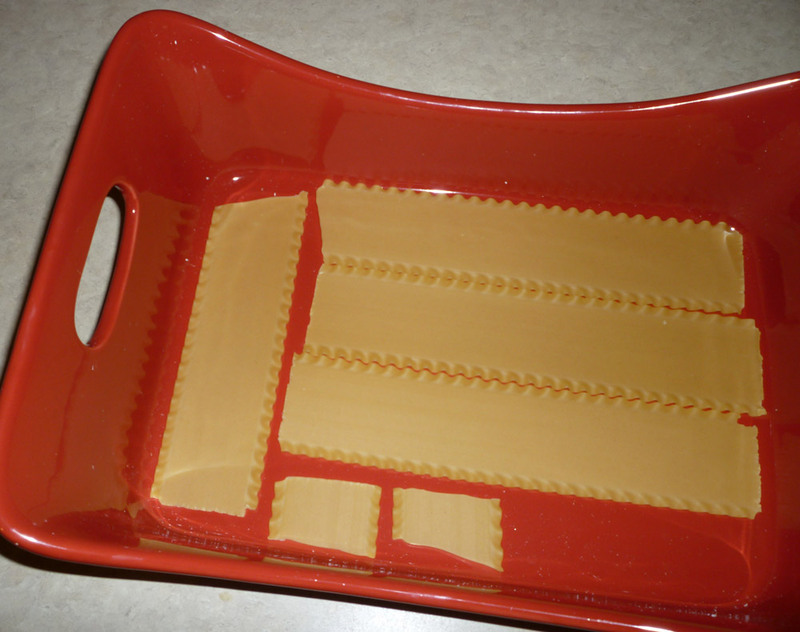 My ideal lasagna pan would of course be deep enough for at least 4 layers of noodles and sauce, with some extra depth to avoid the sauce and cheese from overflowing the pan and making a mess in the oven. It would also have sides that run pretty straight up and down, and corners with very little rounding to them. Lasagna noodles need to fit in the pan in layers — the top layer needs the exact same amount of room as the bottom layer — and the corners of the noodles are squared, not rounded. There's absolutely no reason for a lasagna pan to have flared sides or rounded corners, and in fact it's counter-productive, because it prevents the lasagna noodles from fitting perfectly in the pan. All the different brands of lasagna pans — All-Clad, Le Creuset, Calphalon, Pampered Chef, Cuisinart, Rachael Ray, all of 'em — are like this. They're long enough that you need to lay one or two extra noodles cross-ways. They're a little wider than you really need for 3 noodles side by side, but they're not wide enough for that extra noodle to lay cross-ways. You have to break off part of the noodle. And most of 'em have rounded corners, and too many of 'em also have flared sides. This article started out as a review of the Rachael Ray lasagne pan, which I recently bought for my daughter. The Rachael Ray pan is a very nice baking pan; I would like to get one for myself, for general baking and roasting. But it is no closer to being a perfect lasagna pan than any of the others. The Rachael Ray lasagna pan is too wide for 3 noodles side by side, but not wide enough for that extra cross-wise noodle to fit. It's a very nice pan. But: It's too wide for 3 noodles side by side and not wide enough for 4 noodles side by side. 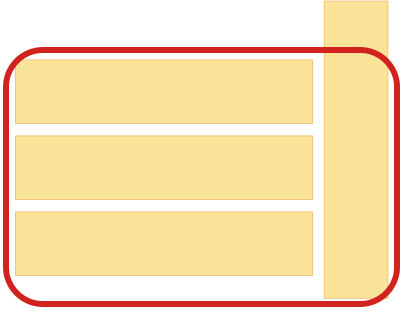 It's long enough that it needs an extra noodle placed cross-wise to the others, but it's not wide enough to hold the entire cross-wise noodle. You can see in the photo the bits that I had to break off to fit in the cross-wise noodle. I like the Rachel Ray pan.... for general casserole usage, it's a great pan! But it's not (IMHO) a very good lasagna pan. If anyone knows of a perfect lasagna pan, please let me know. I'm on a hunt for the perfect lasagna pan. I don’t know if you are still looking, however, I found this pan I just don’t know how deep it is. Thanks for the suggestions, but actually I found this CHEFS Essentials Deep Lasagna Pan at Amazon. It’s kind of pricey, but I ordered it, and it arrived a few days ago. As soon as I make some lasagna in it, I’ll post a review here.